In the September 2013 issue of this newsletter, I wrote a little about the migration of the Mississippian people that inhabited Cahokia Mounds near present-day St. Louis. Signage in the visitor center suggests that these Indians had come to North America via the ancient land bridge that connected Siberia to present-day Alaska. This migration account “rang a bell” with me, since I had prepared a report on human migration for a genetics course I took several years ago. In my research I came across a map showing paths of human migration, based on DNA evidence of people groups collected by geneticist and anthropologist, Dr. Spencer Wells, “Explorer-in-Residence” at the National Geographic Society, and 1956 graduate (now Professor) Frank H.T. Rhodes of Cornell University, who leads “The Genographic Project.” Dr. Wells’ work “has helped to establish the critical role played by Central Asia in the peopling of the world, and has been published in journals such as Science, American Journal of Human Genetics, and the Proceedings of the National Academy of Sciences” (emphasis added). During my classroom presentation, I drew attention to the migration paths from Central Asia, all originating from one central point in Asia. This central point represents the location of the Tower of Babel, from which all the populations of the world were then distributed across the globe, according to Genesis 11. A very similar report, “The Ancient Americas: Migrations, Contacts, and Atlantis,” and accompanying maps can be viewed at http://www.davidpratt.info/americas2.htm. The article by a secular scientist draws conclusions similar to those of Dr Spencer Wells’ study. An additional article by Guy Gugliotta very recently caught my eye. Entitled “THE FIRST AMERICANS,” it appears in the February 2013 issue of Smithsonian Magazine. Based on careful comparisons of Y-chromosome and mitochondrial DNA of the various people groups involved, all three of these secular articles/papers independently conclude that the earliest Americans migrated through Central Asia. It comes as a surprise to most people to hear that there is abundant evidence that the entire human race came from two people just a few thousand years ago (Adam and Eve), that there was a serious population crash (bottleneck) in the recent past (at the time of the Flood), and that there was a single dispersal of people across the world after that (the Tower of Babel). It surprises them even more to learn that much of this evidence comes from evolutionary scientists. In fact, an abundant testimony to biblical history has been uncovered by modern geneticists. It is there for anyone to see, if they know where to look! 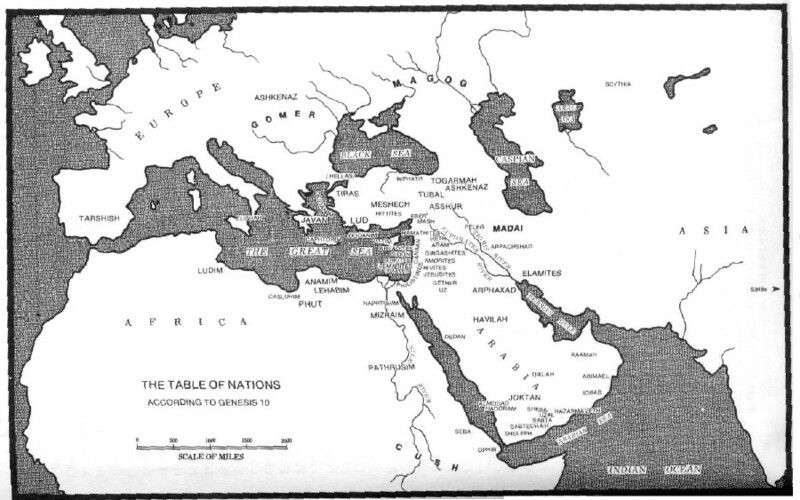 The Table of Nations is a record of the post-Babel tribes, who (sic) they descended from, and where they went. If the Bible is an accurate source of history, one might expect to be able to find a significant amount of evidence for the Table of Nations in genetic data. The truth is not that simple, however, and it is important to keep several things in mind. First, the account was written by a person in the Middle East and from a Middle Eastern perspective. It is incomplete in that there are huge sections of the world that are not discussed (sub-Saharan Africa, Northern Europe, Most of Asia, Australia, the Americas, and Oceania). It also reflects a snapshot in time. It was written after the dispersion began, but not necessarily before the dispersion was complete. Indeed, much has changed in the intervening years. People groups have migrated, cultures have gone extinct, languages have changed, separate cultures have merged, etc. The history of man has been full of ebb and flow as people mixed or fought, resisted invasion or were conquered. The history of man since Babel is very complicated. Modern genetics can answer some of the big questions, but answers to many of the smaller details may elude us forever. This is an important topic for the creation model. The world does not look at the Bible in a favorable light. In fact, it disparages it, sometimes with open hostility. Attacks are often centered on the claim that the Bible is not reliable on historical grounds, and if the history of the Bible is inaccurate, what about the theology? Think about what Jesus told Nicodemus in John 3:12, “If I have told you earthly things and you do not believe, how will you believe if I tell you heavenly things?” Many people today see no history in the Bible; therefore, the spiritual implications are meaningless to them. What would happen for evangelism if the history of the Bible turns out to be true after all (emphasis added)? The next part of our study will focus on what we’ve discovered regarding human migration between Africa and the Middle East. Many types of topography are commonly associated with the term karst. The word itself comes from the Adriatic coastal region of Slovenia where this specific type of landform is featured prominently in the landscape. Karst is considered to be any terrain based on a layer of soluble bedrock, usually (though not always) of carbonate rocks. In the American Midwest, karst is mostly found on a base of limestones (calcium carbonate) and dolomites (magnesium calcium carbonate.) This aspect of karst will be the subject of Bob Farwell’s presentation. The karst observed in the Missouri Ozarks is considered to be of a near-textbook type. It is characterized by well-eroded rolling hills, deep hollows, springs, caves, sinkholes, “losing streams,” natural bridges, and tunnels. Established science tells us that Karst forms when rainwater picks up carbon dioxide from the air and dead plant debris in the soil, which then percolates down through cracks in the rock, dissolving the rock. Some creationists, however, believe that karst formations are the result of sulfuric acid welling up from below, instead of carbonic acid percolating down from above. Some areas of the American West contain karst features that appear to have been formed by a mixture of both processes. The major difference between the above “old-earth” view, and the creationist’s view, is the time required to form the structures. Many creationists do NOT believe that the process was slow, occurring over eons of time. We believe, instead, that a major portion of the processes occurred at the time of Noah's Flood, when “the fountains of the deep BURST FORTH,” as recorded in Genesis 7. This process will be explored by Kevin Anderson in his presentation. Metallic ores are generally found in igneous rocks, such as those found in northern Minnesota, the Rocky Mountains, and the volcanic region of southeast Missouri. Mineral placement in some sedimentary rock in the Midwest is different, however. We believe that such minerals were deposited in newly-laid sedimentary rock during, and shortly after Noah's Flood. The metallic ores found in sedimentary rock resulted from the action of geothermal hot springs. Doug Dexheimer’s presentation will address this proposed process. As a kid, did your mom ever tell you to drink warm milk if you couldn’t sleep? Well, she was right. Warm milk contains small proteins, called peptides, that help calm the brain so that you can sleep well, cycling though all of the stages of sleep. However, there’s a trick to preparing warm milk. You first have to bring the milk to a slight boil and then immediately remove it from the heat. Let it cool a little and drink. The boiling actually breaks up the milk proteins (the peptides) into smaller fragments. It’s the peptides that calm your brain. To help, try doing some mental relaxation techniques before bed. Things like reading a book, listening to soothing music and avoiding anything electronic two hours before you hit the hay. Then try drinking some warm milk…. Sleep, of course, is the most undervalued contributor to optimum health and performance….Did you know that sleep had anything to do with success in sticking to a diet? Get to know leptin and ghrelin. They sound like a Hungarian comedy act, but they are hormones that regulate appetite. Ghrelin is produced in the stomach and signals the brain when it's time to eat. Leptin is secreted by adipose tissue (i.e., fat) and has the reverse effect, telling your brain when you are full. Chronic lack of sleep increases ghrelin and decreases leptin, leading you to feel hungry when you don't really need to eat and to keep eating after you have gotten the calories you need. …even with other benefits, including greater mental alertness, improved concentration, better mood - even lower risk of car accidents - sleep remains underrated when it comes to health promotion. Over a nine-year period, a study found that people who routinely slept six or fewer hours a night had about 70 percent higher risk of dying than did people of similar age who slept seven or eight hours a night. Sometimes all you need is a power nap -- after a stressful day; to counter jet lag; or for a chance to relax. The Ostrich Pillow is a dream come true. Burrow your head and arms into its cozy ‘cocoon’ and you’ll be in dreamland before you know it. One was given all the food it wanted. The other was given a limited-quantity, but nutritious, diet. The mouse which was kept in a state of “semi-starvation” for most of its life ended up living much longer than the mouse which was provided with the unrestricted diet. Calorie restriction generally involves eating less food than the amount one normally desires. Doing so every day (which will then supposedly extend one’s life, thus increasing the total number of days one will be required to stifle his cravings!) is difficult for anyone. On the other hand, “intermittent fasting,” or “IF,” involves eating fewer calories, but only some of the time. Prior to his study, Mosely had led a very sedentary lifestyle, and suffered from many health problems. He tried several variations of “intermittent fasting” in his efforts to extend his own lifespan. After an extended trial of his “5/2 fast diet,” Mosely reports that not only had he lost weight, but he had also obtained better blood sugar and cholesterol levels. Furthermore, he was able to achieve a socially acceptable schedule by simply juggling the “fast” days so as to accommodate his social and other life activities. Based on the mouse experiment, Mosely believes he will likewise live a much longer life as a benefit of his IF diet. Furthermore, he expects to continue the program for the rest of his extended life. CSAMA is seeking an editor for, and contributors to, our newsletter. If you are a born-again Christian, believe the Bible is the infallible word of God, subscribe to the literal 7-day creationist viewpoint, if you have researching and writing skills, and if you have suitable ideas for articles to contribute to our publication and can meet a monthly deadline schedule, please contact the newsletter webmaster via the link at http://www.csamanewsletter.org.